​On the 9th July 2018, the AJ Morris Ltd team started work on a new lined reservoir in Norfolk. Below is a short video of the project thus far. Watch this and more videos like it at AJ Morris TV . 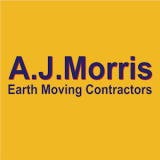 A J Morris Ltd launch their brand new website. The snow may have stopped parts of the UK but it won't stop the A J Morris team! ​A J Morris Limited have started work on the new Reading Football Club and as per the short video, the project is progressing nicely! More updates on this project coming soon. ​The going was good at Goodwood Race Circuit today with the team at AJ Morris Ltd making some great progress. More to follow on this project soon.